Call me crazy if you must but I do not want to know what is going to happen in the book, what could happen, what Mark or Kit or Ty will be suffering or discovering, I rather wait for the book and find out then because then the excitement will be out of me, I will know that something is coming, that at some point what I read a month before will happen. I do not want that at all. I might be the only one who thinks this way, we might have our differences when it comes to reading but this is how it should be, I know that trailers were invented for a reason and we love watching them, for example “Game of Thrones” or “The Walking Dead” but there is something different when it comes to books, I simply cannot read a snippet or a preview, I have in the past but only a paragraph or a line, but Queen of Air and Darkness, I cannot, I do not want to know beforehand, I’m waiting for December 4th and perhaps a little after that until I get home and find the book there waiting for me, because I know that once I open that book there will be no going out for air, no darkness black enough to stop me from reading, and no Shadowhunters, Faeries, Werewolves, Vampires or Warlocks strong enough to separate me from that book. Also I have this feeling that I am going to be screaming, crying, sighing, falling in love and have my heart broken from Chapter I; so no thank you, I prefer to experience all of this when the book is out and in my hands. Sorry if you thought I was going to even mention the new previews that Cassie has left around the web, I actually glimpsed around her recent posts, ignoring them if they mention anything about the plot or characters because all that matters is that next month is the month, and I will be waiting patiently for my copy. I am preparing the tissues, the blanket, and the corner where I will be doing all the reading and crying. 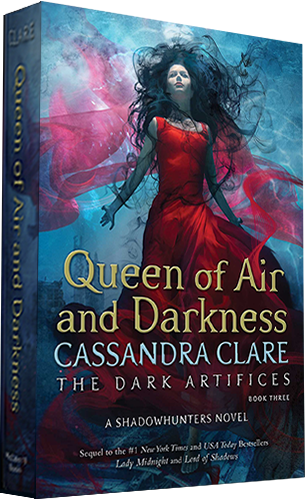 We know what happened in Lord of Shadows, which is why the first chapters of QOAAD will be terrible. Thank you for stopping by the blog, remember that I am most active on Instagram with all the books I am currently reading and the ones that have left an impression on me the most. That is it, have a nice day or night.